Scott wins everything, its crazy, he enters a competition, he wins. This time he won a weekend training with Helen Jenkins and Science in Sport. Luckily for me, it was for two people :D Thanks Scott. There was however one small problem! A few days before the trip, I got a sniffle, which turned into a head cold :( I attacked it with Lemsip, but it persisted and tried to ruin the weekend. I picked Scott up on Friday afternoon and we crammed all our kit into the back of the van, which filled the van! We took far too much stuff, I had both my bikes, two helmets, 5 pairs of running shoes……………. crazy. Off we set on our road trip to Porthcawl. 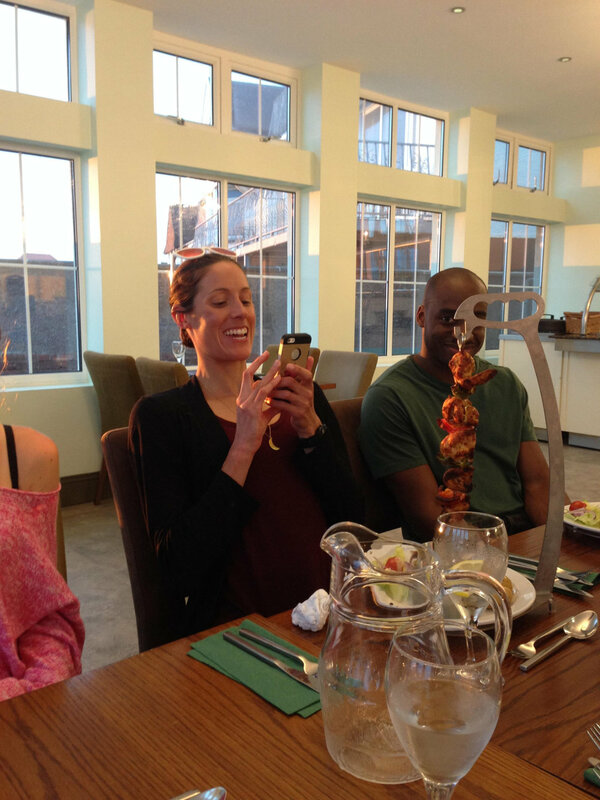 We all met up in the hotel on Friday evening and we met with Helen, Helen’s Husband, Coach and former Olympic Triathlete, Marc, the other lucky winners and last but not least, Emma, the Senior Sports Nutritionist at Science in Sport (SiS). Emma gave us a SIS endurance pack for the weekend, containing all the gels, bars and shakes that we would need. I supplemented my weekends nutrition with Lemsip Max! Athlete fuel. Monday morning started bright and early with the Porthcawl Park Run. A timed 5km run along the seafront. This was my first Park Run. I joined last year but never actually took part in any of the runs. It was brilliant, really well organised and loads of fun. Its good to have people to chase down, it make the run much more motivating. I tried to catch up with Heather and Matt, but they were too fast for me (I blame the head cold). Helen of course won, and set the course record! awesome. The team, photo. Matt, Scott, Me, Heather, Helen, Ashley and Pete. After the run, we were back to the Hotel for a full Welsh breakfast then changed and ready for the first ride, which turned out to be a monster of a ride up a mountain! The ride was amazing, the scenery breathtaking! The roads were a bit rough in areas, but it was a great challenging ride. Helen spent some time riding and chatting with us all individually during the ascent. Matt just left us, he was determined to be the king of the mountain, but why bugger off on your own when you get the chance to ride side by side with a world champion? We made it to the top, but my left calf was twitching on the last 100m! it was steep. 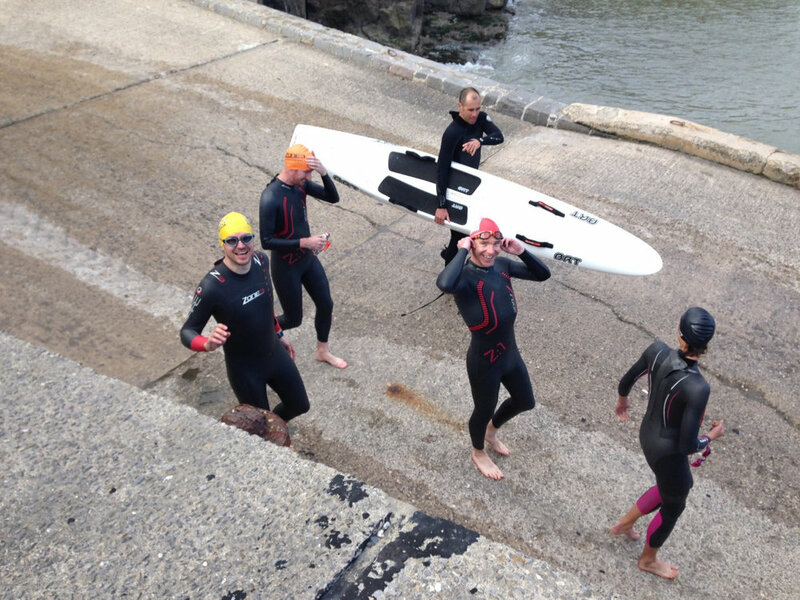 Next up was our first open water swim. It was Pete’s first time, so we took it steady. 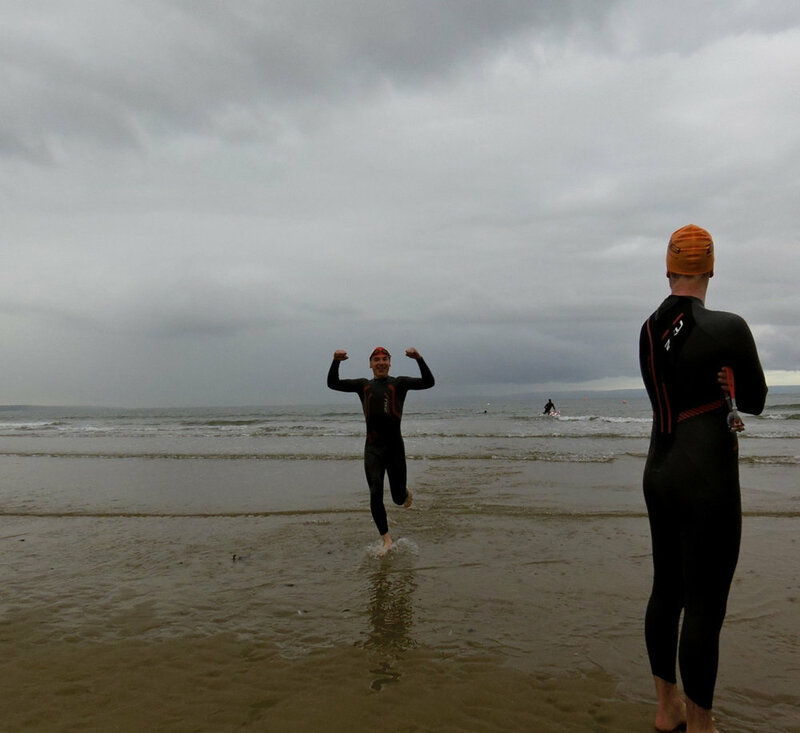 Most of the time it was just Helen and me swimming together, it was surreal, there I was, in the sea, swimming side by side with a world champion triathlete! amazing. 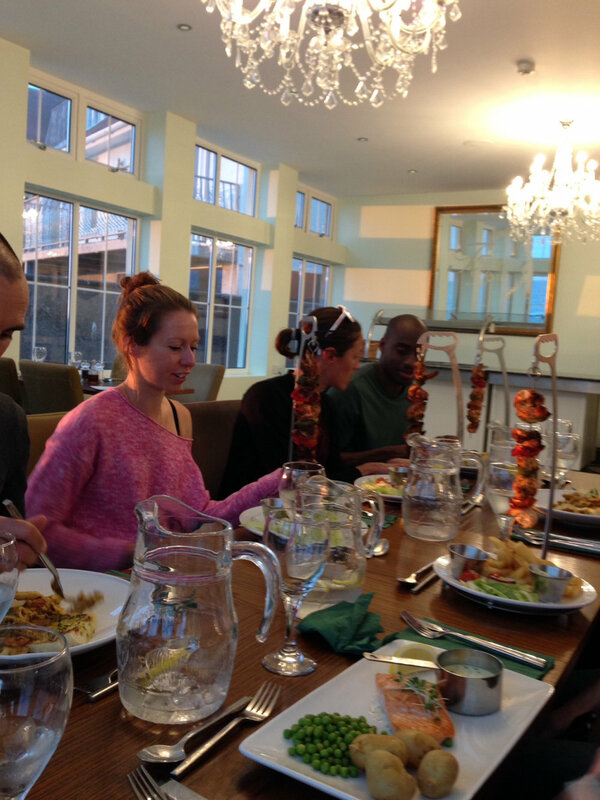 Helen really was there with us for the whole weekend, she didn’t just turn up for the training, we all ate together too. and its a 6:30 start, this time starting with a swim. Marc and another friend of the Jenkins’ set up a course with some buoys so that we could practice beach starts. 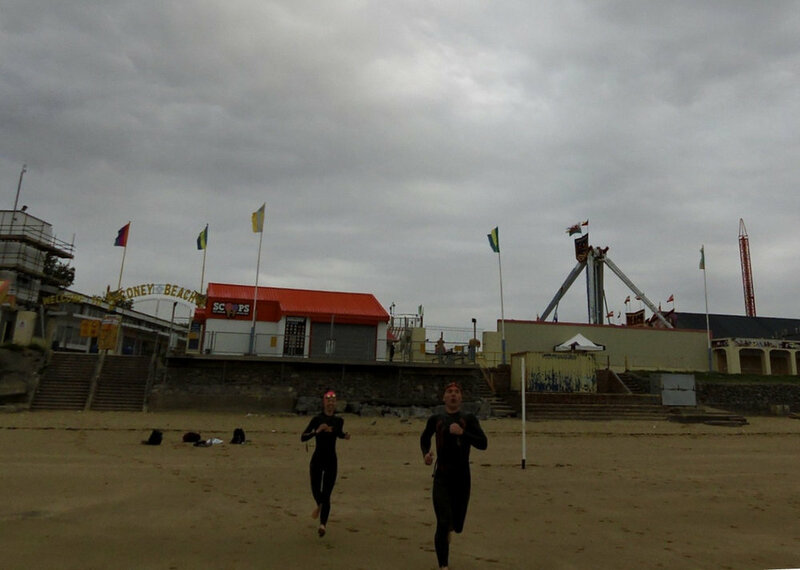 We had to start from the beach, swim out and round the two buoys, back up onto the beach, round a pole and out for another lap. Running through the surf is exhausting! Heather was the quickest runner, Matt proved he was the cyclist and Swimming is my strength, so we started the race with handicaps, Emma, Helen and me doing two laps with Emma staring, me a few seconds later, then Helen chasing us down. I passed Emma on the first buoy and Helen didn’t catch up to me until the second buoy of the second lap. She wasn’t trying of course, but I’m still claiming my victory of the swim. After another huge breakfast we ventured out for another, flatter ride followed by a 6km run (10km for Helen and Heather) and a chill in the sun before we all headed off home. and one that I will never forget, what an opportunity! The weekend was made perfect by the fact that Helen and Marc are such nice people, they were amazing. Emma from SIS was brilliant, she’s an IronMan triathlete who helped and advised us on race nutrition. I expected that the weekend would be a big cooperate push of SIS products, but it wasn’t at all like that. I will be using SIS products again though after getting a better understanding of how they research and produce their product. I also made some new friends and hopefully will meet them again, maybe even in a race. Thank you SIS, Thank you Helen and Marc, thank you for an absolutley amazing weekend.